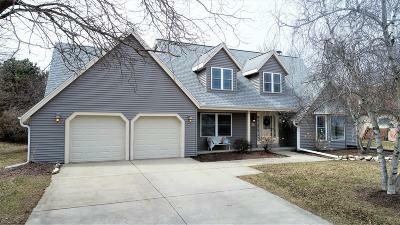 Springdale Estates offers this beautifully maintained 3 BR, 2.5 BA Cape Cod home. Conveniently located between Hwy F & Springdale Rd, you'll love this homes premier location as it provides easy access to I-94, Bluemound Road & all the surrounding amenities. A quick walk takes you just 2 minutes down the street where you'll find a childrens playground, tennis courts & a baseball diamond. Enjoy the bright kitchen that offers a dining area surrounded by windows & two sliding doors letting in all of the natural light you can soak in. Head upstairs to enjoy the openness of the master bedroom w/ an ensuite bathroom, walk-in closet & vaulted ceiling or get lost in a book in the cozy loft area that could be used for a reading nook. New roof, carpeting and all interior painted in 2018.